Looking for outdoor jackets? Check out our Buyers Guide! Hiking jackets offer excellent protection on your tour! A good equipment is a must when you are mountain hiking, hut touring or trekking! Walking jackets, hiking shoes and trekking poles are part of your personal equipment and therefore have practical features. Just as with all the other functional jackets weather protection and breathability are particularly important. Hiking jackets, or trekking jackets respectively, are at least water repellent or even waterproof and make sure you get the necessary weather protection while touring. Whether you choose a comfortable softshell or a model that features Gore-Tex and taped seams is up to your taste and the weather conditions. 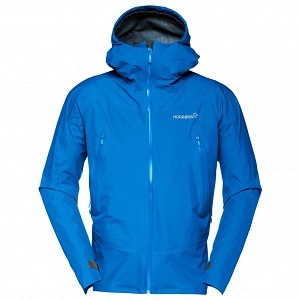 Reliable wind protection is just as important as breathable when it comes to hillwalking jackets. Because body moisture is quickly transported outside and the unpleasant wind chill effect will not even occur. Depending on your personal taste and the conditions, a good softshell or a fleece with windstopper might just as well be enough to be used as a hiking jacket. Softshell jackets are perfect for hiking since their reliable breathability remains the same even on a physically demanding tour. Only when weather conditions really turn nasty and it is raining constantly do they reach their limits. Hiking jackets, in a nutshell, are tough, are made of a particularly strong fabric or feature abrasion-resistant materials. Pack size and weight are important factors to be considered when it comes to multi-day tours where you have to think about what to take with you beforehand. A small pack size allows you to put your jacket into your hiking backpack with ease so that you are perfectly prepared for unstable weather conditions. Trusted brands such as Vaude, Schöffel, Patagonia, Mammut, Bergans do not take chances when it comes to additional features. This is why all walking jackets either have a fixed or a detachable hood. For use in cold regions, there are models that feature a warm lining which can save you an extra insulation layer if you are wearing the right clothes underneath. So-called 3-in-1 jackets are especially versatile. If you remove the zipped fleece jacket from the inside, the 3-in-1 jackets become full-fledged transitional jackets in the blink of an eye which are suitable for not quite so cold temperatures. In order for you to have your hands free and have small items within reach while hiking, smartly placed outside pockets are important. They are placed in such a way, that they are not covered by the backpack's straps or the hip belt. That way, you do not have to stop to take your backpack off on your way if you need to take out the compass, a small snack or a map.